We will introduce an improved version of our Bass Guitar Foot Synthesizer at the 2019 NAMM Show. With this product, we are picking up on the dedicated pedal board organists use to play bass notes with their feet while keeping their hands free for melody and chords. Previously available bass pedal boards for guitarists have implemented this concept, but with certain limitations. For example, they are limited with a single octave range and a keyboard conﬁguration that forces guitar players to switch constantly from keyboard to fretboard. We aim to improve the usability of the pedal bass concept for guitar players by using foot buttons instead of pedals and by placing them in the conﬁguration of the bass fretboard. This design places two octaves on a graphic of the fretboard with modiﬁed proportions that allow enough space between the buttons. It also opens new musical possibilities by using MIDI, so it’s not limited to playing only bass. Also, the matrix conﬁguration of the buttons make it possible to play chords. Furthermore, the buttons are color-coded as they are on a keyboard to help keyboard players on the fretboard. Plus, the addition of a digital display and the doubling of the buttons' functions operate as a data entry keyboard which adds the ability to program polyphonic arrangements directly into the device. This asset allows different instruments to be programmed into different MIDI channels as well as allowing the notes to be pre-programmed digitally one by one, or captured in real time by the instrument. These additions expand the scope of the instrument beyond merely the bass accompaniment for the solo guitarist, into an accompaniment of a set of instruments under the control of the solo musician in real time while playing. 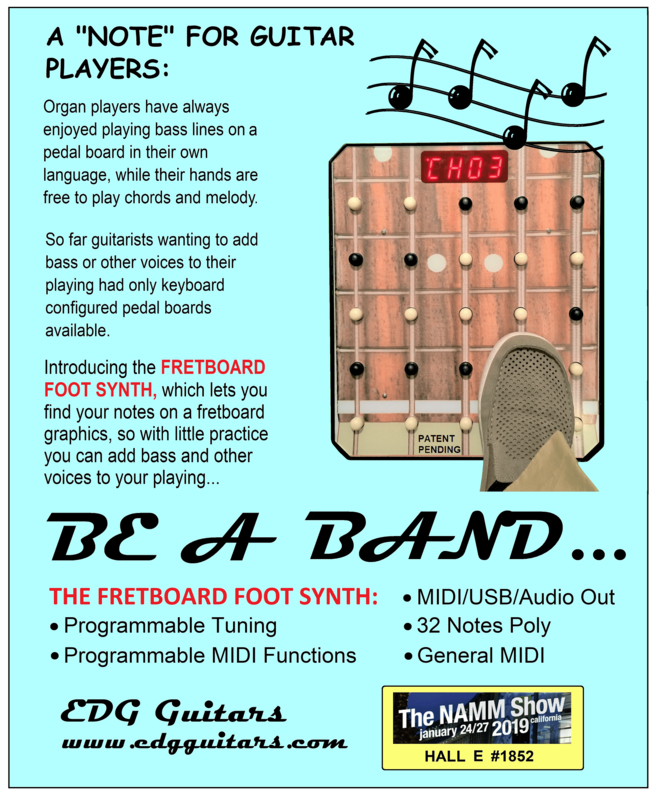 This means that from now on, the instrument will be referred to as the more generic name "Fretboard Foot Synth", as it is not limited to playing only bass notes. This development opens a vast field for musical experimenting and performing for the solo musician. We will be at Booth # 1852 in hall E during the 2019 NAMM show in Anaheim, January 24-27.